This is a delicious appetizer. It’s my husband’s favorite. I was surprised when I served it to my kids and they liked it. Not because it’s not good, but because the salmon is smoked and not cooked, and there’s onions and capers in there. 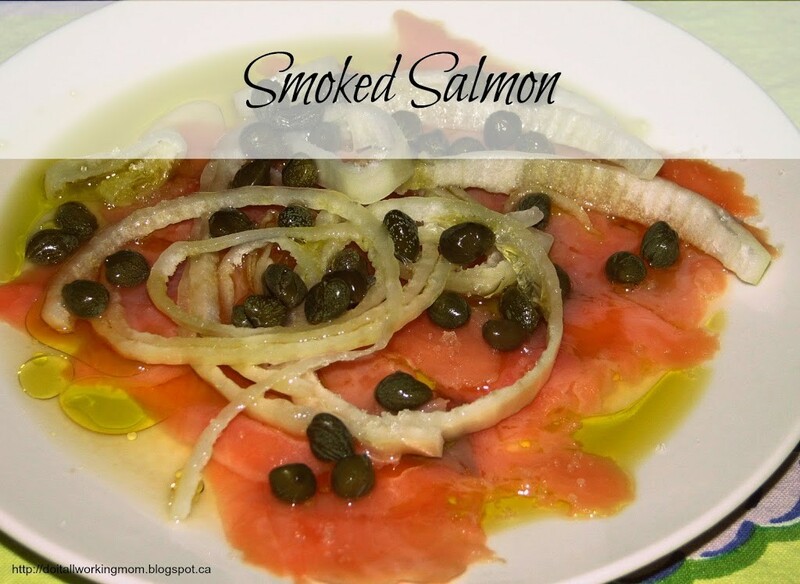 Place the smoked salmon in a plate, cover with onions, capers, olive oil, lemon juice and a pinch of Fleur de Sel. You can also add some fresh ground black pepper if desired. Enjoy this easy and really good appetizer. I wish my family would eat this with me! Yum! Yes, I’m really lucky my kids like it! I’ve enjoyed smoked salmon similarly prepared for years. Do you think that the Fleur de sel makes a big taste difference? Before I tried fleur de sel, I used to make with regular salt. It was still good but it’s a touch better with fleur de sel!